Winners in the 75k giveaway will be notified by email today. I was going to publish names but…yeah, I didn’t collect names. Just email addresses. Which, obviously, I won’t go posting here for the hackers to find, eh? If I don’t hear back from any winners by the weekend, I’ll pick some new winners and send e-notifications. Congrats to all 20 who get packets of goodies, and the 4 who won the gift certificates! I’m putting together a quick video with the answers to the community survey for this weekend! Hey friends – my apologies for the YT mispost the other day. Due to a mysterious YT upload issue (which I’m sure wasn’t user error, how could it have ever been? lol)….it was a patron-only video that went live for a few hours. Some of you got the notification from YT and then the video was missing …that’s why. It was a private video….an alternate version of today’s card, and I knew there were are few of my YT trolls who wouldn’t be able to resist comments on some aspects of that one – and I hadn’t intended to subject myself to their critique. Unfortunately that video did go live – and the trolls hit it fast, because in just the little time it was up, there were lots of negativity and thumbs down. So yeah, that’s a thing. It’s part of being a YouTuber, and sometimes it’s not so fun. Lesson learned….check my YT settings more carefully. LOL! Now…on to the project for the day! 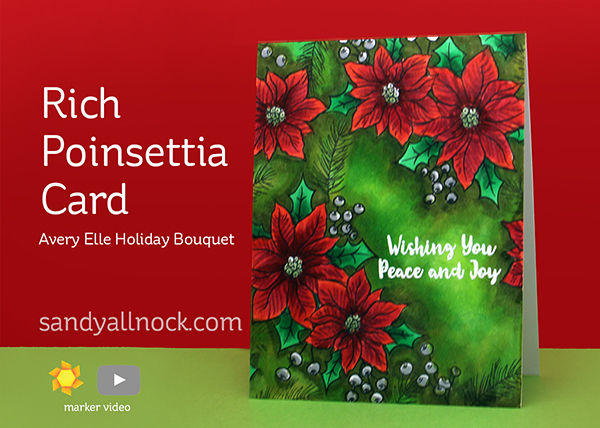 Every year I create a poinsettia card, methinks….this year is no different! This time it’s a beautiful rich background, with smaller flowers than usual…I think most poinsettias tend to be oversized but I like these smaller ones a lot, with all their extra leaves and berries! Watch the video below or click HERE to see it in HD on YouTube. And on top of all this fun…it’s a completely flat card. Bonus eh! I aspire to Copic color like you someday, Sandy! Your skills are amazing! Stunning! 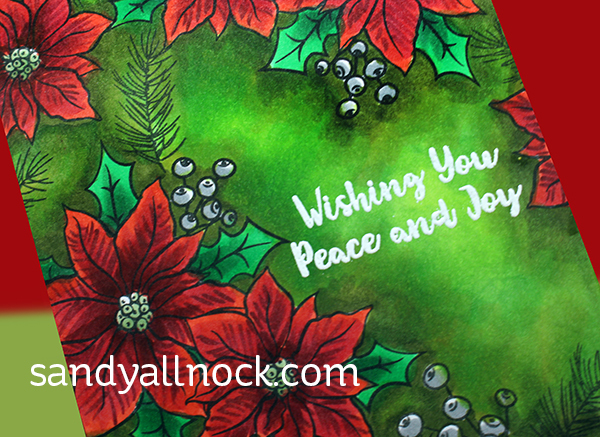 I don’t make traditional red and green Christmas cards, so may have to try this in non-traditional colours. Awesome video. I saw that other video and it was AWESOME. I felt so privileged and will definitely become a patron! I love your videos. I see the notification and immediately set a list of to dos to do with the knowledge that my treat for doing will be a video. Yay!!! AWESOME coloring! Thanks for the video! Beautiful card–I simply don’t understand how these awful people have the time to spread negativity. I check very few sites, but the trolls are active on NPR, PBS, and any site that challenges their moronic, narrow, xenophobic world view. I’m angry that they feel the need to intrude on the peaceful sanctuary of craft videos. Perhap if no one responded they’d pick up their toys and go away. Lazy attention seekers! YUMMY!! Is there anything you can’t do!? Sandy, you are so sweet to share your ideas and techniques, and to be so kind and encouraging to people you don’t even know. YT trolls are weak and small minded. Maybe one day they can be as generous as you. Thanks for sharing joy, pure joy! I really don’t understand the purpose of the YT Trolls. Besides irritating the YT-er, does the negative feedback and thumbs down take away credits earned from YT? Are they hired guns to distract viewers from watching your videos? Whoever they are, they need to get a real job or hobby – preferably something with a positive impact! At least you’re still upbeat and not deterred from sharing your amazing talent. I appreciate you sharing the process so that I can learn a thing or two! Absolutely gorgeous card. It looked so easy when you do it. I’ve pulled out my Christmas stash and hope to do something lovely just like you do. Thank you for inspiring this 85 yr. old homebound lady to continue breathing each day. You are my inspiration, that’s for sure. Well I didn’t see the other video, but what a share the opinion of the ladies before me if it go’s about “trolls”. I love always your video’s, I learn much from them an they are a big inspiration! This card is beautiful, I love the bright colours. I have even looked a moment at the video you made earlier ( 2015) of a white poinsettia and I wil certainly give that a try after watching it. JUST STUNNING! I am in AWE! Sandy – thanks for the update. I saw the other video listed and was going to watch it after I finished watching a different one and when I went back I couldn’t find it. Thought I was going crazy! Thanks for all you do! Don’t listen to the trolls. E0keep creating because it makes you happy. You don’t have to please the world and sadly not everyone will like what you do. Rise above and I love seeing you create anything. Sandy, that card is just stunning and gorgeous! LOVE the poinsettia a lot. Thank you for sharing the video, too. Dimension and glow all in one layer – it’s a Christmas miracle. LOL I also like the small poinsettias. What coloring and color choices! Definitely “rich”! I was glad to see the card the other day & both cards are lovely. I gave you a thumbs up on each of them. Love this card – gonna have to try this. And I was one of the lucky ones who happened to see the white poinsettias video yesterday, so now I’ve seen two versions of it. Thank you, even if it was a boo-boo! Pay no attention to those YT “trolls” – they’re cranky children who didn’t get their naps – maybe someday they will be adults like us!! !